Amesh Wijesekera has been selected from close to 100 international designers for the International Fashion Showcase at London Fashion Week. The International Fashion Showcase (IFS) nurtures and presents work from the most exciting fashion talent from around the world. Amesh’s selection is a major step in nurturing local talent resources which is a key component of Sri Lanka’s creative industries’ development initiated by AOD, with British Council’s direction and industry partners British Fashion Council, London College of Fashion UAL and Somerset House’s involvement. The next lap of growth and development for Sri Lanka will be majorly influenced by how we manage to unleash the creativity of local talent. Globally, the creative industries are now recognised among the most vital sectors in defining the value propositions for any country, with countries like the UK demonstrating the proof of their potency and future global giants like Singapore and China already channelling major investment into them. Sri Lanka too, will be aiming to redefine its value proposition through design, business and innovation. Paving the way for a national strategy on this, AOD has already initiated a discussion involving major industrial powers and businesses that are connected to design led innovation; this was with the British Council as the international strategic partner, since the organisation is an entity directly linked UK’s creative industries’ success. In these discussions, a key aspect identified as essential for Sri Lanka’s creative industry development is the growth and nurturing of creative talent by facilitating education, employment and opportunities. AOD recently moved these strategies into action and collaborated with the British Council to facilitate an outstanding young designer from Sri Lanka, to take the global stage of International Fashion Showcase (IFS) at London Fashion Week, making an incredible opportunity accessible to local talent. 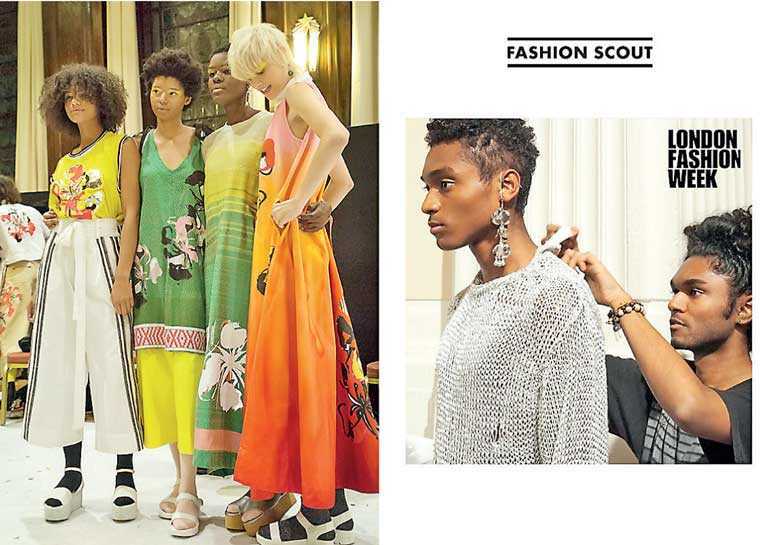 The designer selected and groomed for this opportunity was Amesh Wijesesekera, whose international debut in 2015 earned him the winning place at the international runway of the prestigious Graduate Fashion Week in London, followed by an invitation to show at Fashion Scout at London Fashion Week 2017. 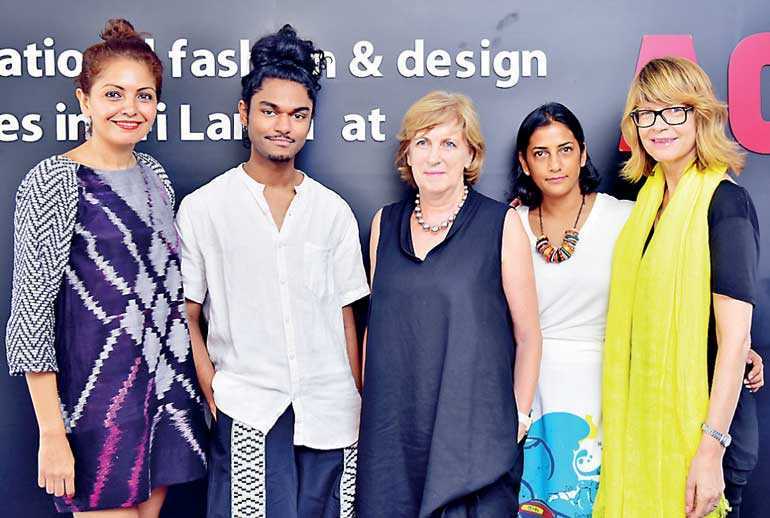 Amesh, who is a graduate of AOD and S. Thomas’ College Mount Lavinia, has been noted by the global fashion leaders such as the legendary Zandra Rhodes and Edeline Lee as promising talent out of South Asia, and is well deserved to be linked up with further opportunities to represent the kind of fresh creative energy that Sri Lanka can produce. Through this latest opportunity facilitated by AOD and British Council, Amesh will be showcasing his work at London Fashion Week’s IFS in February 2019. The work has been carefully selected to represent Sri Lanka’s flourishing fashion business infrastructure which involves a complete ecosystem from designers, state-of-the-art manufacturers, heritage textile artisans, merchandising, marketing and retail to delivery. This way, Amesh and his work will become powerful indicators of how Sri Lanka is a progressive fashion business destination for the world, contributing to the local creative industries’ development and reputation building. With International Fashion Showcase at London Fashion Week being one of the most iconic events in the fashion business with a steady influx of a global audience of fashion elite from around the world, the opportunity to create a viewpoint into Sri Lanka’s talent, infrastructures and manufacturing methods is a remarkable opportunity for the local creative industries’ development. AOD Founder, entrepreneur Linda Speldewinde speaking about the big picture of Amesh’s IFS appearance in February 2019 and its greater relevance to Sri Lanka, said: “When we were initiating the policy discussions on developing the creative industries, the key drivers were to increase the contribution of creative industries to the financial economy and knowledge economy. And among the key factors that would fuel these creative industries were fostering a healthy culture of competitiveness locally and internationally, investing on research and education, and nurturing the talent. Speldewinde further mentioned that Amesh will be participating in the full IFS programme facilitated by British Council, British Fashion Council, London College of Fashion UAL and Somerset House which includes an online business development programme lead by London College of Fashion, UAL and a creative residency within Somerset House Studios in London and finally, the participation in the final showcase during London Fashion Week in February 2019. Speldewinde added that although AOD is essentially an educational entity, it is firm in the belief that education is a much more all-encompassing experience that involves hands-on working, industry networking, international exposure and the chance to interpret their roots, heritage and beliefs in fresh and innovative ways. The International Fashion Showcase (IFS) nurtures and presents work from the most exciting fashion talent from around the world. Working in partnership, the British Council, British Fashion Council, London College of Fashion and Somerset House provide a tailored programme for 16 emerging international designers, including business development and a creative residency within Somerset House Studios in London. IFS will culminate with a free public exhibition during London Fashion Week in February 2019 at Somerset House, showcasing the work developed by the designers in a series of spatial installations exploring urgent issues and new ideas that are shaping fashion globally. The International Fashion Showcase was established in 2012 as a platform for emerging fashion designers to exhibit their work during London Fashion Week. Bringing cutting edge fashion design to London from around the globe, IFS invites us explore different cultures and consider current world issues through fashion. To date IFS has showcased more than 600 designers from 70 countries. www.internationalfashionshowcase.com. For more information on how AOD is driving the creative industries’ development policy making for Sri Lanka, and to become part of the discussion on forming national strategies and vision, reach AOD on 0115867772/3, email info@aod.lk or log on to www.aod.lk.